Oral cancer is a serious finding that can lead to death if not properly diagnosed and treated. According to the Oral Cancer Foundation, approximately 40,000 people are diagnosed with oral cancer in the United States every year. In the United States, one person dies every hour of each day from oral cancer. However, when the oral cancer is detected at an early stage by a dentist, the survival rate approaches 90%. The entire clinical team in our Orange, CT dental practice takes our responsibility to screen for oral cancer very seriously. White area on the floor of the mouth and side of the tongue. This represented oral cancer. A review of your medial history that identifies environmental, lifestyle, and genetic risk factors. A visual inspection of all the soft tissues of the oral cavity. Palpation of all soft and hard tissues to identify any unusual findings. Intraoral pictures of any suspicious areas. Use of the Sapphire Plus Oral Cancer Detection System to identify questionable areas that cannot be visualized nor palpated. The oral cancer screening is painless and only a few minutes. For highly suspicious lesions, immediate referral to an oral surgeon is given. 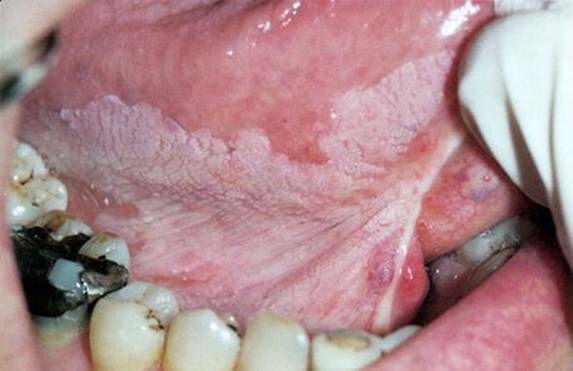 Oral cancer is most prevalent in males above the age of fifty with a history of tobacco use. But cancer doesn’t discriminate and there are many cases in younger, healthier individuals. Be sure to visit us every 6 months and allow us to perform this extremely important exam!